Who is Genius Loci and why hire us? 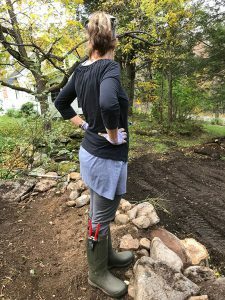 Owner, Cyndy Fine says, “I often find myself explaining to prospective clients about the difference between gardeners and landscapers, or what I refer to as the — you get what you pay for — speech”. Although we highly respect landscapers and the attention and experience most bring to caring for your lawn, plowing your drive, weed whacking, or mulching, Genius Loci provides a dramatically different service. When you hire Genius Loci you can rest assured that we are highly trained and experienced in designing and planting beautiful and ecologically healthy gardens. With specific, extensive training and education in sustainable design and practices, we offer you the opportunity to effect change in your landscape and in turn, promote and protect biodiversity for the planet. We hope you will continue to put your trust in us, or try us out for the first time, now that you know a bit more about us! A variety of certificates from the U.S. and Great Britain. We are former and present jewelry and graphic designers, professional basket weavers, an award winning kitchen and bath designer, art teachers, floral designers, fine artists, journalists and photographers… a creative force. Many of us have owned our own business and all are responsible, innovative, personable free thinkers and self-starters with high standards and impressive work ethics.